Here at Smile By Design, we know the wonders of a full smile makeover. We have seen many patients come to us, unhappy with the way their smiles look and refusing to smile in the fear that someone might notice their teeth. Luckily, we can perform a smile makeover using dental implants, allowing us to replace our patients teeth with beautiful restorations that can be molded into a smile that they will love. 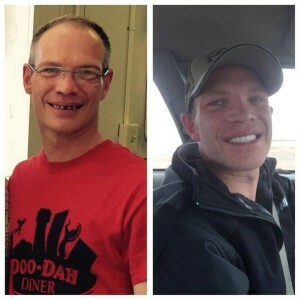 A man in Wichita, KS recently discovered just what a smile makeover could do when a kind customer recently paid for his entire treatment. Today, Dr. Donian Shen is blogging from Mountain View, CA to talk about this man’s situation and how dental implants helped him out. In Wichita, KS, there is a restaurant called the Doo-Dah Diner. Working there is a man named Brian Maixner. Maixner’s story is interesting because for the longest time he has been struggling with an set of crooked and missing teeth. Not only that, but he has also suffered from infected areas of his mouth, which caused him quite a bit of pain. This all changed in January when a customer left him a tip that he will never forget. A man named Fred Boettcher, who suffered from his own dental problems when he was a child, decided to leave him a $25,000 tip. This tip was meant to cover the full costs of Maixner’s smile makeover treatment. Two months later, Maixner’s old, flawed teeth have been replaced with a complete set of dental implants. When asked, he could only mention how excited he was to finally be free of pain. The reason why dental implants are becoming so popular is because, unlike other teeth restoration treatments, only dental implants can provide permanent replacement teeth that function and feel just like natural teeth. The reason for this is because of a process called osseointegration. During the implant procedure, the dental implant is placed in the empty spot left behind by your missing tooth. While it recovers, osseointegration works to see your implant accepted by your jawbone and gums as a natural piece of your oral anatomy. The reason this process is possible is because dental implants are made from titanium, which is a metal that the body does not recognize as a foreign material. Because of this process, we are able to provide our patients with replacement teeth that their body will recognize as being no different from any of their remaining natural teeth. As you can see, dental implants were able to provide Brian Maixner with a smile that he can’t help but show off. Just by restoring his smile, Maixner looks ten years younger than he did with his old teeth. With dental implants, we can provide this same kind of treatment for our patients in the Mountain View, CA area. If you would like to begin your own complete smile makeover, we encourage you to contact us and schedule a no-obligation consultation with dental implant provider, Dr. Donian Shen, today.